Martin and Steven walked out to site today in fine weather, although it was a biting east wind. After getting our breath back from the walk in, we cleaned and recorded the surface of Trench 1. 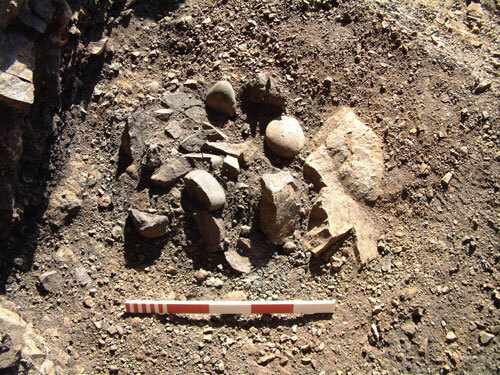 The surface comprised hearth setting F.03, areas of deposited fire-cracked pebbles, and fragmented animal bone. We also took levels on the surface, which was incredibly flat. 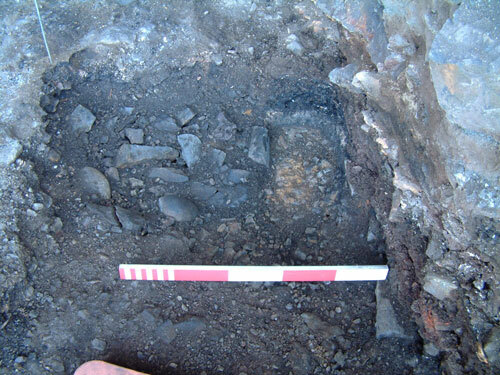 After recording this floor, we continued to remove the archaeological deposits (charcoal-rich areas in images above). 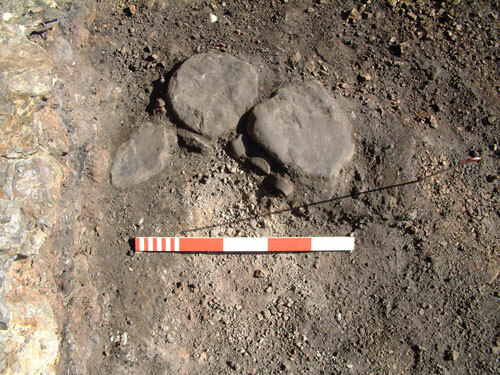 This soon revealed more features including a small post or stake-hole complete with packing stones and a second hearth (F.04), revealed in the section of the north baulk of the trench. There were few small finds recovered today, with the exception of a pebble hammer stone. However, we did recover significant quantities of animal bone, adding to the large assemblage put together over the weeks excavation. 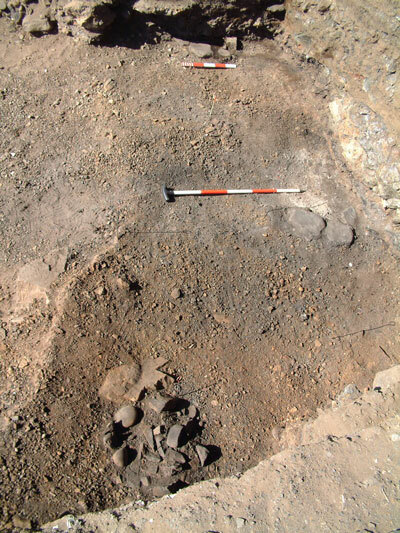 Although small finds were lacking, the number of features increased dramatically for such a small trench. 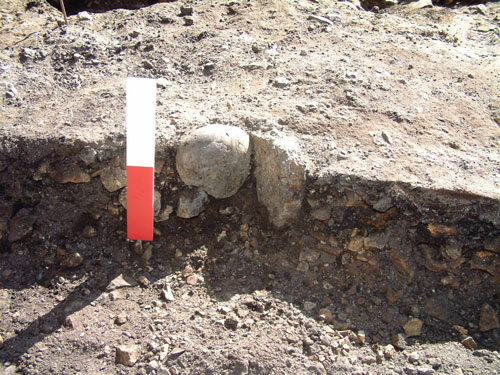 In the central section of the trench, just to the north of the post-hole and hearth F.03, Martin uncovered yet another slab-built hearth (F.06), some of which had been robbed away - the stones possibly utilised in building another hearth elsewhere on site. 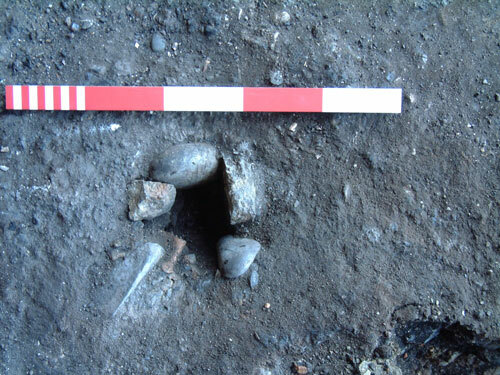 Meanwhile, in the south end of the trench, Steven was uncovering deep ash and charcoal-rich deposits containing large well-preserved pieces of animal bone and some good lumps of charcoal. While removing these deposits Steven uncovered a small heap of fire-cracked pebbles, some of which appeared to be angled downwards into the ground. Small air-filled voids were also visible between the pebbles. With the new surface cleaned and the archaeological features revealed in plan, recording then took place. 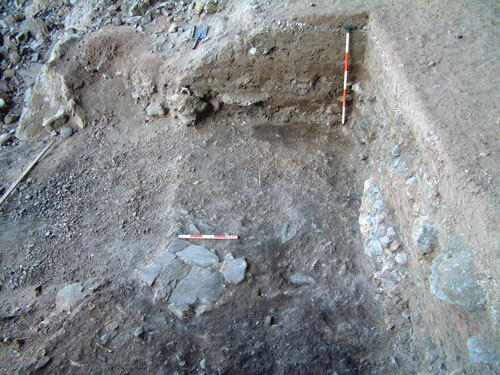 The image below shows the different features in Trench 1, looking from the south (Scales=1m and 0.5m), after the excavation and removal of hearth F.03 and post-hole F.05. Pit feature F.07 can be seen in the immediate foreground, then partially robbed-out hearth F.06, and hearth F.04 at the far end of the trench. These features are all contemporary in date; the hearths located directly onto the natural, levelled chips of stone derived from the roof of the rock shelter; the pit cut into this material. 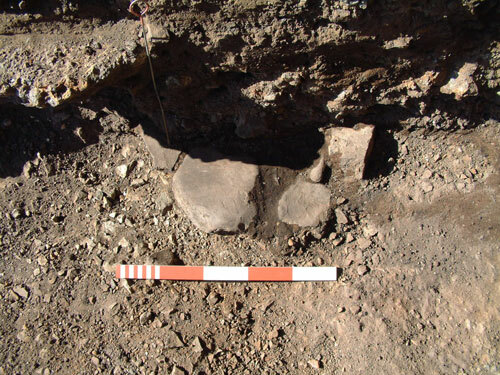 Further recording of the features then took place, after which Martin sectioned and removed hearth settings F.04 and F.06, while Steven sectioned pit feature F.07. The hearths revealed little in the way of deposits for sampling, although charcoal samples for radiocarbon dating were recovered. The pit was a difficult feature to section due to the packed stones, air-filled voids and surrounding stone setting. 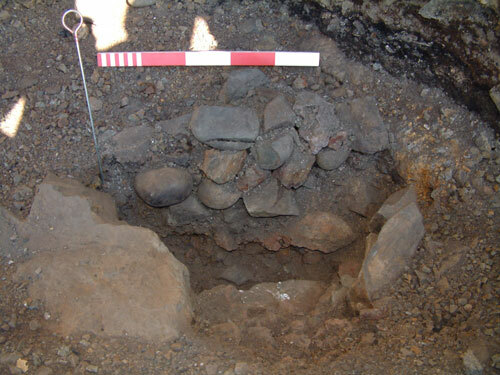 The pit appears to have been cut into the natural rock chips and stones forming the levelled platform of the rock shelter. The south, west and north arcs of the pit had been set with a stone lining (on the west two courses high), while the east side comprised the original cut into the natural. 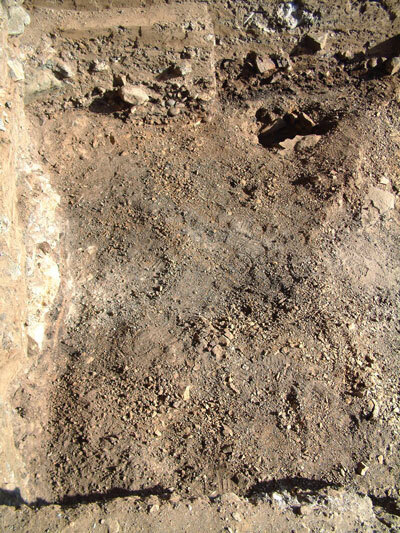 The fill of the pit comprised some natural stone in the bottom third, above which it had been completely filled with fire-cracked pebbles - including complete and heat-fractured material. No small finds were recovered from the fill of the pit, but a fragment of bone, burnt bone and charcoal lumps were recovered. These will be useful in dating the fill of the feature. The excavation of these features concluded our work in Trench 1. 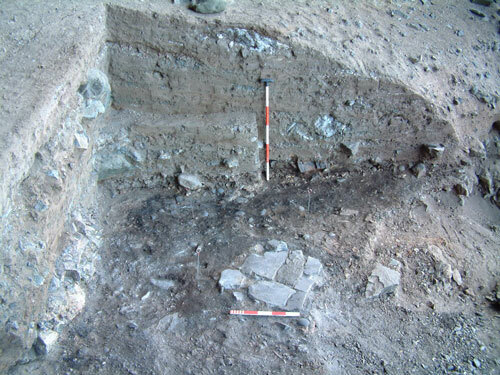 The image below shows the surface of natural stone chips used to level the floor of the rock shelter in this area of the site, with the excavated pit (F.07) at the far, south end. Throughout the excavations in the trench it has become obvious that the archaeological deposits extend to the north and north-east, and especially to the south below the huge sloping bank of overburden. Although the lighting is not helpful in this image, the dark band representing the archaeological deposits is clear beyond the pit - up to 0.35m deep. Later this week I will post another news bulletin regarding our excavations in Trench 1 at the Fiskavaig rock shelter, providing some details on the chronology of the features we have uncovered and their association with the artefacts we have recovered. Thank you for your comments and interest in what is turning out to be a very important site in the Iron Age of Skye and the western seaboard of Scotland. Looks like a magnificent site!